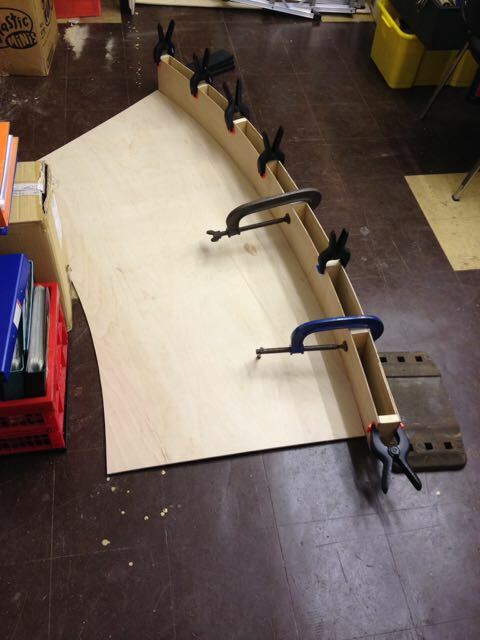 Mr Chairman and LBH spent a few hours starting to put together the problematic curve baseboards at the Newport end of LMJ. Here is progress to date. The beams, of which there are two, are made up of 150mm x 3mm plywood held together/apart by 2"x1" softwood. These will be attached directly to the end sections that Chris Yates made for us to match with those on the rest of the scenic section. Please note the use of a BR1 FB plate that is holding everything in place while the glue cures. The 6mm ply seen in the photos is there merely to maintain the relative positions of the other members. We are yet to address the trackbed itself. Its Christmas, and if its not Christmas Cake or Mince Pies then it has to be Stollen. And whilst we're on the subject of food, here's your reminder that our Christmas Party / Gathering and P4A4 reveal will be Tuesday 6th January at Shaftesbury Centre from 7:30 as usual for a Tuesday. I'll send out an email about catering arrangements later. Last Tuesday Don called in the club on his way home from parental DiY duties and promised he'd be along for the 6th, though not with a submission. He claims even 7mm is getting too small to see now! Apologies for the lack up updates but I've been unwell and the software has been playing up again. I've had to revert to good old XP to be able to edit this week. Terraforming continues. First, some saw work to cut the foam down to size. We probably won't make it any smoother than this as the ground on the real thing was worked over a few times anyway. Next some more foam to fill in dips and build up to the final level. Meanwhile on Cwmdu LazyBonesHall has been adding etched tiebars to the pointwork. First the one on the NCB line. Then the one in the middle of the level crossing. Which leaves just one more to do. In the larger scale on Pavilion End the coal siding has been re-laid.Originally I tried to be too clever here and model a rough bit of track as per the prototype. However, it was too rough for reliable running. And also coupling and uncoupling was unreliable on the curved section. This has been tested and it does reliable coupling operations. So re-ballasting and other groundwork is in progress but the trick will be to match up the old and new ground cover finish. An overall spray with a dirty colour will help. Well, I think that's the correct term for these unexpected growths from the squirtyfoam base for the scenery. The stuff must keep on expanding inside and then find a way out. On a very quiet Tuesday night at the club (i.e. just LBH there) work on the rewiring and conversion of Mike Edmunds Cwm Du to DCC reached the point where Grommet, everyones favourite Class 20, can traverse all the plain track under DCC control. Well, having only posted the photos, then left you guessing as I was preoccupied, I'd better explain these shots. We're not re-creating Frankenstein's Monster's brain but building up scenery. This is how it goes with squirty foam forming the face of the cutting. Or is it Squirty Cream? Anyone for Strawberry cake as well? This 66xx belonging to LazyBonesHall has been around a while, but after a trip to Swansea and passing through Bernie's workshops it has come back smoother running and with refinements. Also along for a test is the power bogie for the Swindon CrossCountry or Class 120 unit. It ran up and down nicely, attached to wander leads so its back to my workshops for fitting of pickups and final gluing of the wheels to gauge. It's a High Level Lo-rider power bogie and easy to put together. Delivery of two more boards from Chris Yates had us in the main hall after the Bingo session. This is board No 17 with the high level line leaving the fiddle yard and a low level surface for storing the trains that run down the Usk branch. It matches up with board 16 seen below, the angled end joins onto the main scenic section of the front of the layout. With them both erected TXYS in his "I've been thinking . . . " mode suggested it would look really good with 7mm scale track on the viaduct and a dock with water underneath. He's even checking the levels to see that the water won't run away! Having finished our current run of exhibitions it was time to re-organise storage in the clubrooms. I won't describe the sequence as there was a lot of shunting and shifting to get boards out of the way. We did, of course, resort to our usual technique of removing the clubroom door to give us plenty of clearance. Frecclesham has ended up in the layout room at the end nearest the double doors. The plastic cover is lovingly called its condom. 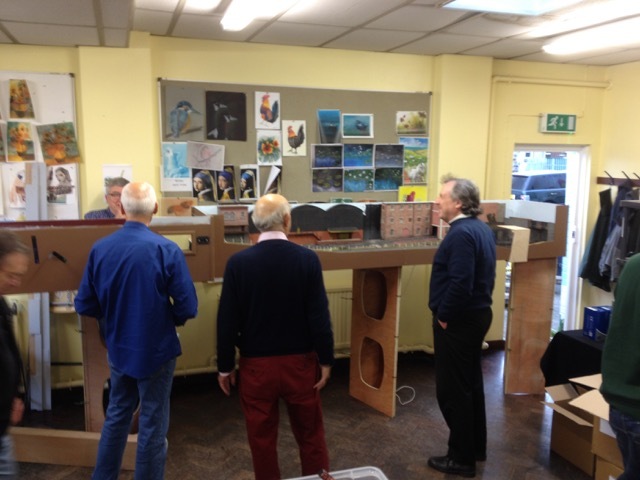 LMJ was moved further down the room to give better acces for scenic work and track laying. Frecclesham fiddle yard takes up less space in a vertical plane. 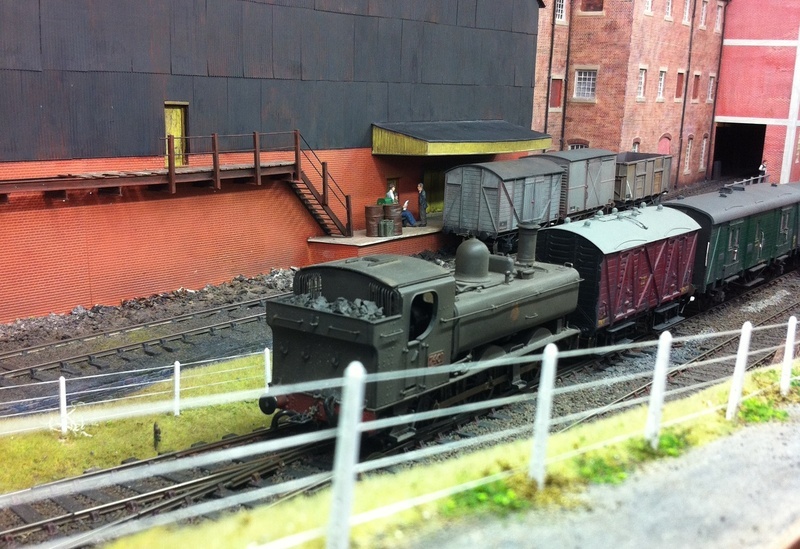 And we welcome Mike Edmunds' layout Cwmdu to the club for fettling and finishing. Small, but with lots of potential. 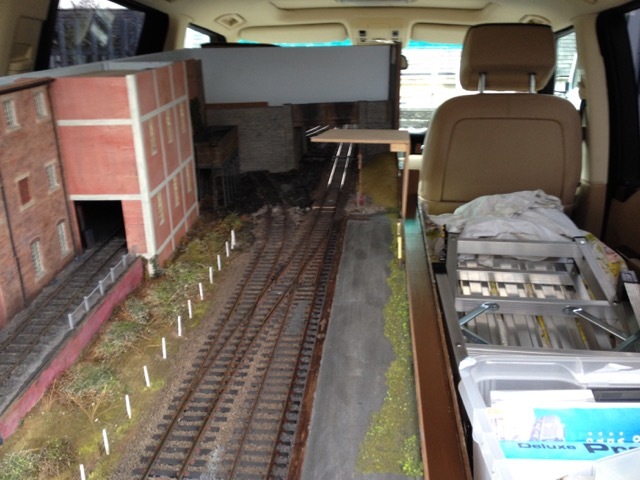 The layout travels in two estate cars. Here's the section in Rod's Range Rover. The rest was in my Octavia. We were a little tight for space here with a fire exit at one end so were checking the position with Mike the organiser. Successfully erected we progressed through the sequence of moves. Here the coal train is being formed ready to depart. Towards the end of the day we had some unscheduled moves. Here are some shots of the parcels train that seems to have wandered in from Frecclesham. The 74xx is a new recruit and did sterling work all day. A smart purchase by TXYS. I like this shot looking down from the top of the path. Takes me back many many years. 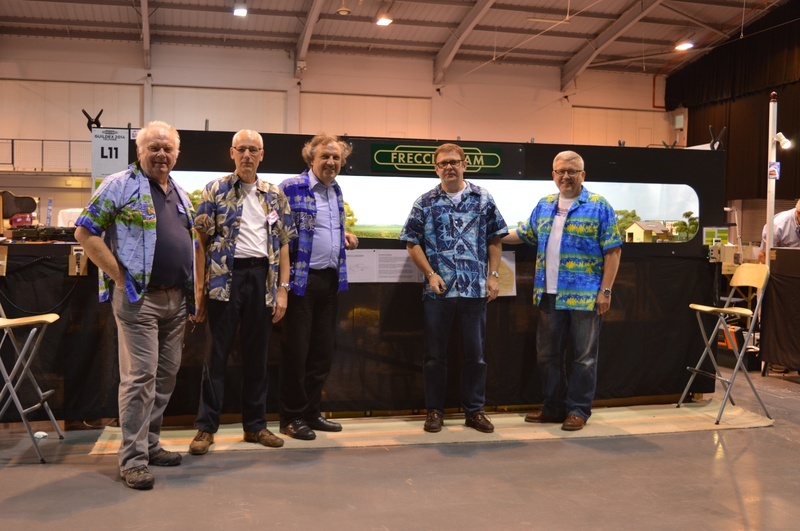 This weekend we took Frecclesham to the Cardiff Model Railway Show. There are no new pictures of the layout as its been done before and very little has changed. In fact so little has changed that we worried ourselves. 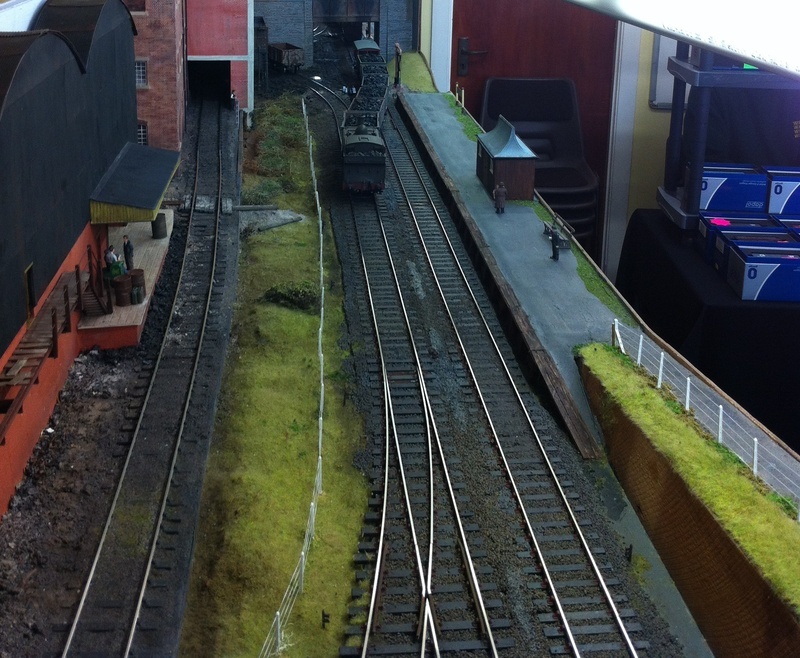 After Telford in September the layout was stored and we just pulled it back out again for this weekend. It was so easy to do (apart from the obvious physical manhandling) that we worried - what had we forgotten? What didn't we fix? It shouldn't go this smoothly! We had few problems running the layout and we even had time for TXYS to replace the Lenz controllers with NCE cabs. And then on Sunday from close of show to back stored in the clubroom was done in 90 minutes. Of course, all this was not possible without the combined efforts of the members. The key thing that got us working on Friday was the incentive. Time for a curry lads? Finally, a departure from the norm. 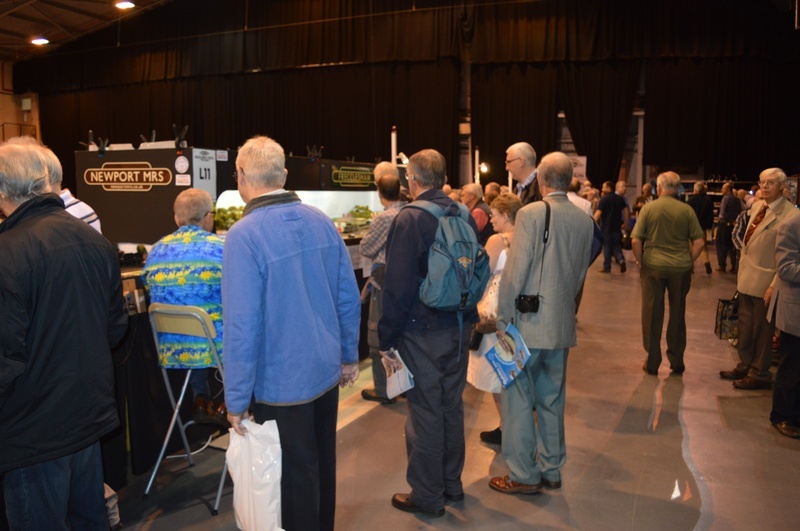 Former NMRS member Dave Pengelly was trying to contact me at the show but I missed him. Dave, if you're reading this then email me, details on the contact page. If you've detected a change in the updates it's because I've been away for a week's holiday. 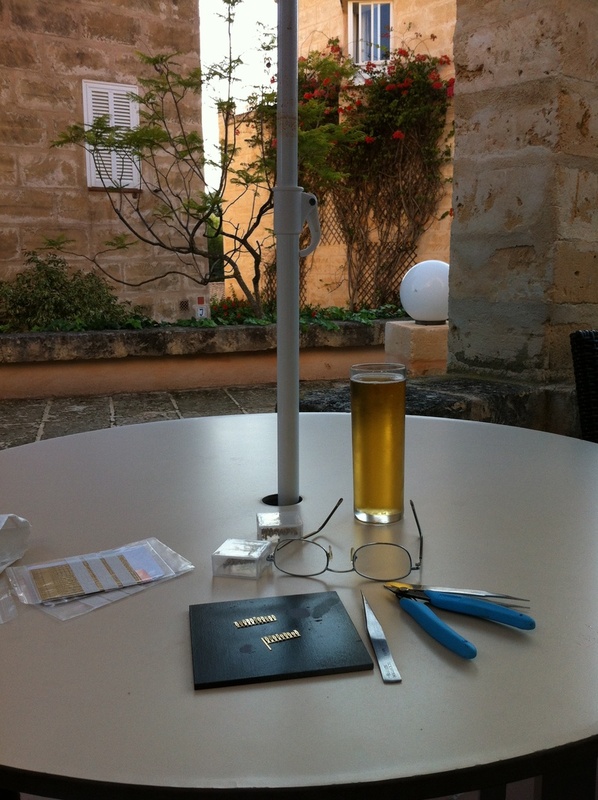 But to prove my dedication to the cause here's a pleasant evening's entertainment in the warmth of Mallorca. Yes, it's those fiddly litle brass etchings for pointwork again. Only three members this evening, Alastair, Rob and LBH. Rod (LazyBonesHall) took LLanastr to Scaleforum. Here's evidence we were there. 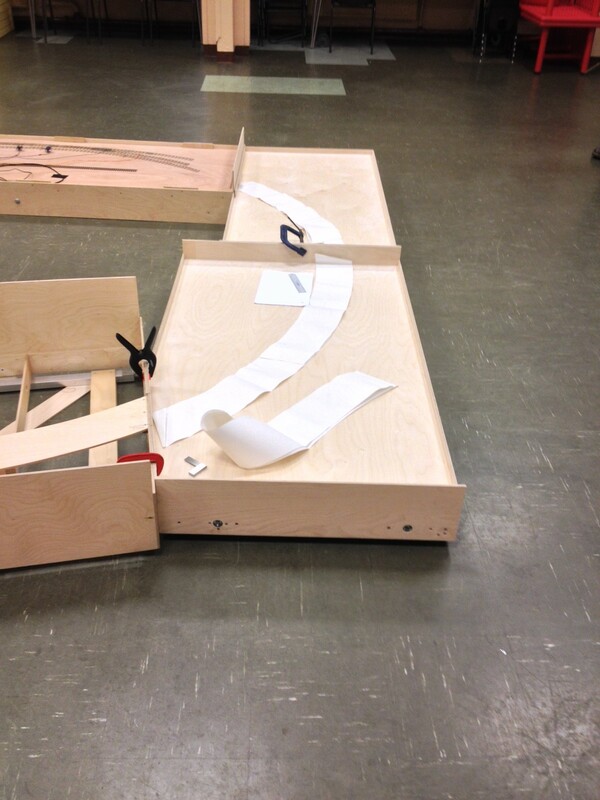 On Tuesday some baseboards for Little Mill appeared at the club for checking of alignments. Thanks to Chris Yates and Morgan Gilbert for making the trip down. The wide arc will be the alignment if a 'viaduct' that will support the main line, while underneath it will be the flat surface of the fiddle yard where the Usk branch and Glascoed trains will be handled in cassettes. A low key evening with myself, Steve Bell, Rod and another visit from Albyn Austin bring lots of books and magazines. This, of course, meant all things Bshops Castle Railway and Colonel Stephens too. A bit of work was done, though rather embarassingly at one point the three club members had their noses in books whilst our visitor was bending up fiddly etched brass trackwork components. And cake was eaten. Mrs Bell had baked some apple flapjack things and Albyn indulged us with a coffee and chocolate sponge. With some predictable weather for once, TXYS aka Steve Neill decided to finally arrange the long promised BBQ and running session on his garden railway. So on Sunday 16th the weather held out and it was very pleasant indeed. Here's my Hymek that did a lot of circuits. Pannier tank 7402 on a freight. You'll notice I forgot to pack a brake van with the stock. A graceful sweep around the garden. And some luxurious planting. Sausage and burgers under the check cloth. And a station area with passing loop. We were trying to be clever here and run two trains on the same track, but the freight caught up with the autotrain. So a very enjoyable afternoon with good wine and food and conversation. A couple of small visitors to the club this Friday. The Beattie Well Tank was built by Tony Bennett and its new ownership is under discussion by a couple of interested parties at the club. No.4 has appeared before but was present for checking as the chip had been re-fitted. Its a small chip that fits in a small space between the front of the motor and the back of the smokebox. A bit of a fiddle but it ran well (if slowly) on test. It is now ready for a further outing with Llanastr at Scaleforum after fitting AlexJackson couplings. 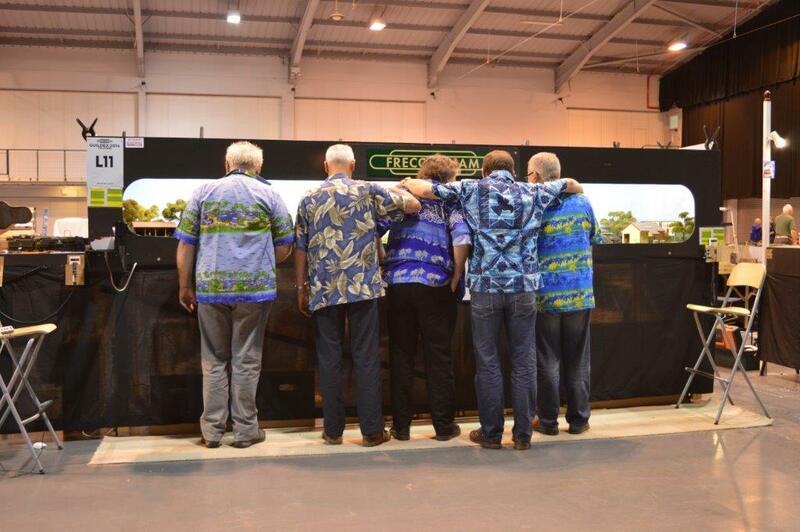 We took Frecclesham to the Gauge O Guild Show at Telford and made an exhibition of ourselves. 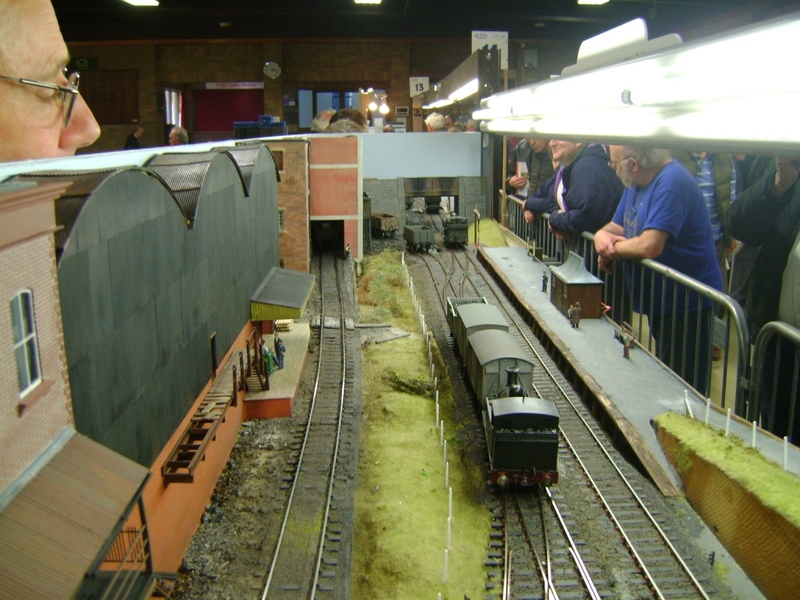 The layout was well received with a very high number of positive comments from the visitors and loads of questions about how we did it. Even at 4:30 on the Saturday we had a good crowd watching events. And it continued likewise on the Sunday. Going back to Tuesday, we were visited by Albyn, a contact of Rod and Steve and a dedicated light railway enthusiast. Photos and discussions had a very heavy Bishops Castle Railway bias. And who knew there was a Bishops Castle Railway Society? As Albyn follows events on this website (so that takes us up to four confirmed viewers) he came with a cake. It was started pretty quickly so you'll have to make do with a photo of the wrapper. Preparations for Telford continue with a few items of parcels stock for our proposed additional train. They are of various origins and ownerships, but Wagonman has been giving them the once-over. They are now with myself for fitting and adjustment of the Dingham autocouplers. This Fruit D is Wagonman's. Here are some more coaches for Litttle Mill from Mike Garwood. This is a South Wales stock 70 foot Van Third to diagram D82. At 70 foot they were very long coaches - well, that's my excuse for chopping off the far end in the photo. 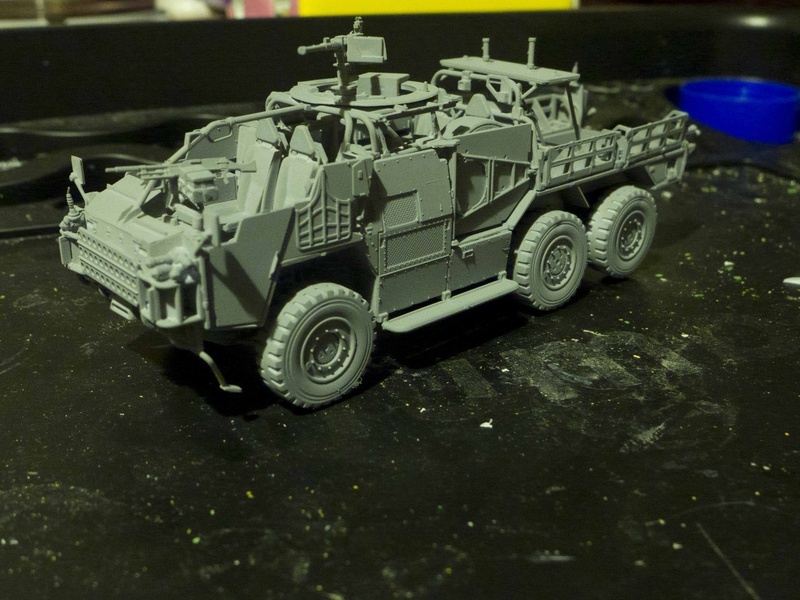 For more coaching stock, but in 7mm, and back to Wagonman. As an inveterate trawler through Bring and Buy, and Executor sales stands at shows, Al often comes in with bargains. This was a part-built Slaters 4 wheeler that came with the Brake version as well. Although that one will have to be built from the beginning - oh look! - Wagonman's started already! At a suggestion from Rod, my thoughts turned to a Workmens train for Pavilion End using such vehicles. Preparations continue for the trip to the Telford Show. Whilst the layout itself is still safely packed after returning from Wigan, a few other problemsvneed to be addressed. 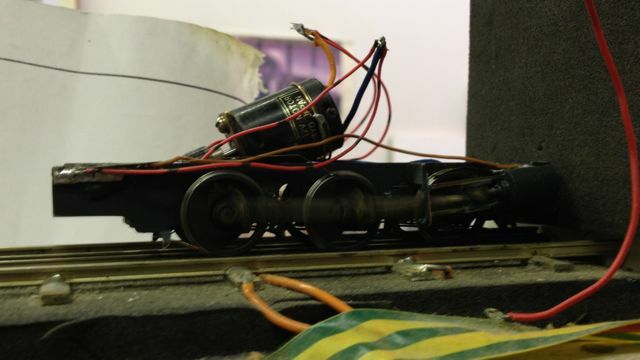 The DI 4-4-0 was a bit unreliable about starting smoothly so TXYS has re-motored it and it was present for a test run. It's much improved. At Wigan we had problems on the second day with dirty wheels and all the stock, not just the locomotives, had a good layer of muck on them. So I've tackled all the wagons and coaches in the stockboxes. Here's a sample of what I found. We had a visit from Richard Price bringing along a couple of new purchases. Here's a Class 31 from a DJH kit. It does have the tanks for the gap underneath stored in the box, before you ask. 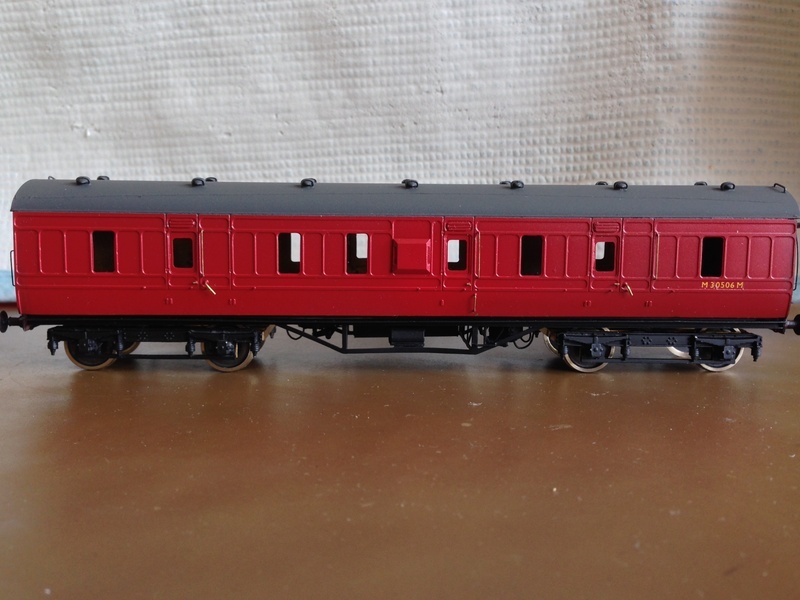 Also here's one of the new Dapol SR brake vans. 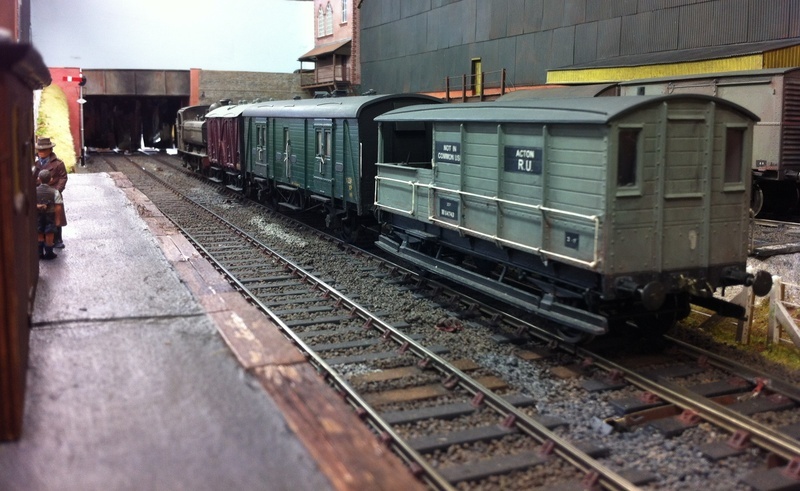 We have so mnay brake vans available in the club I think we could run two brakevan specials. Also Miles the Dentist came bearing gifts of a family sized packet of biscuits, which added to the orange polenta cake from TXYS left us over-provisioned ase were just the four of us. 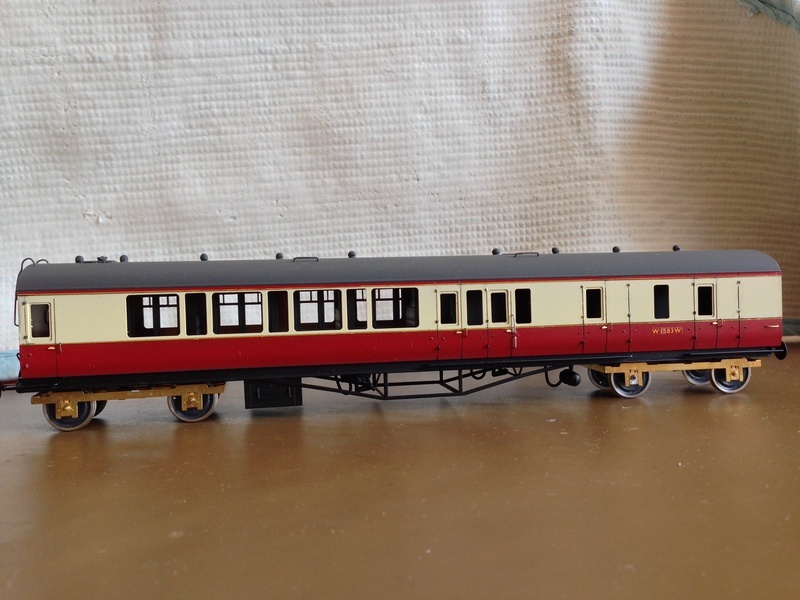 Miles continues to make progress with the Swindon Cross-country / Cl 120 DMU. As reported a few weeks ago, Steve Bell has this weird interest in 7mm narrow gauge. Here are some of his efforts so far. The big box is, surprisingly, of LNWR origin, and one of the others is from the Corris railway. And these are to be followed by this next one. 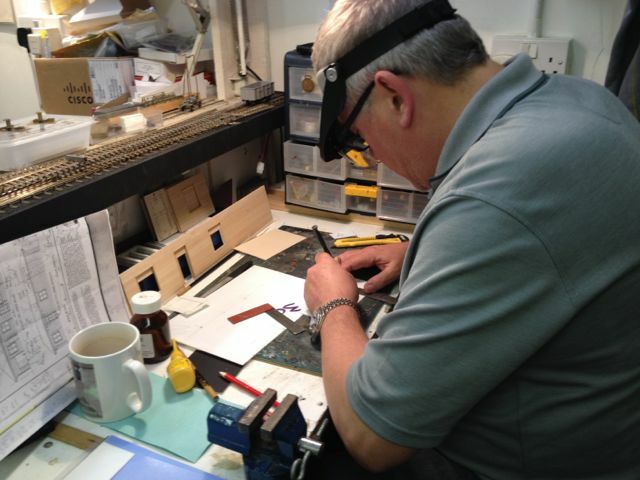 Moving down the scales to 4mm, Mike was applying the lining and numbers to one of Rod's coaches. Next he had to tackle a GWR 70 ft brake third which is longer than the longest length of lining transfer, so there would have to be a join and a perfect one at that. Results next week! In the layout room more of the foam underlay has been stuck down on LMJ. 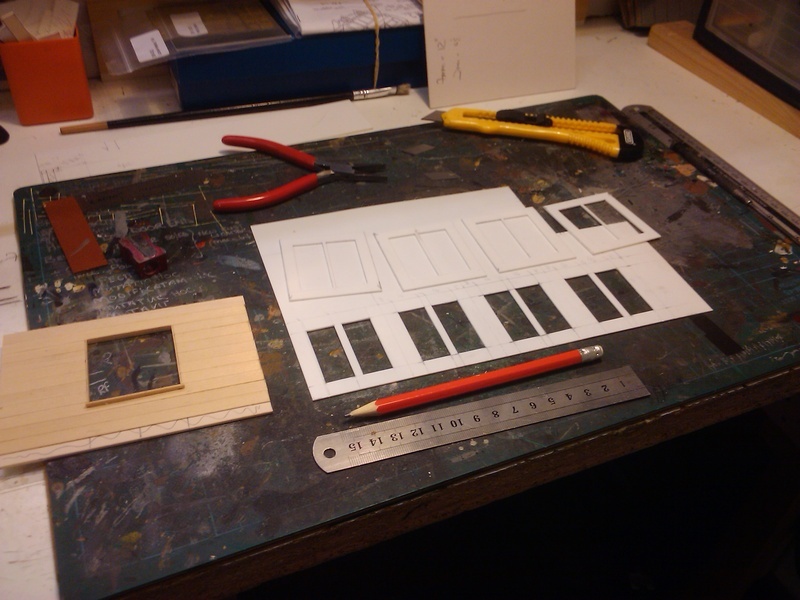 Next week comes the track base of 3mm MDF. Here are some updated shots of the most recent stock Mike has been working on. The first two are from Comet kits. Not sure who manufactures this kit. Good result though. We have a lot of books at the club to sell from Tony Bennett's estate. This has brought modelling to a standstill as everyone picks up a book and gets engrossed with lots of "I didn't know that" and "That's a great photo, look at the detail!". This is the next turnout I'm working on for LMJ. It's another C10, the other half of the crossing that I finished last month. Continuing with the Off-Piste activities of club members, here's Mike catching up with his other interest, badminton. It was a semi-final at the Commonweath Games. Note the typical 'at work' pose. Work continued on Frecclesham station building, and Rob sent some photos in later. 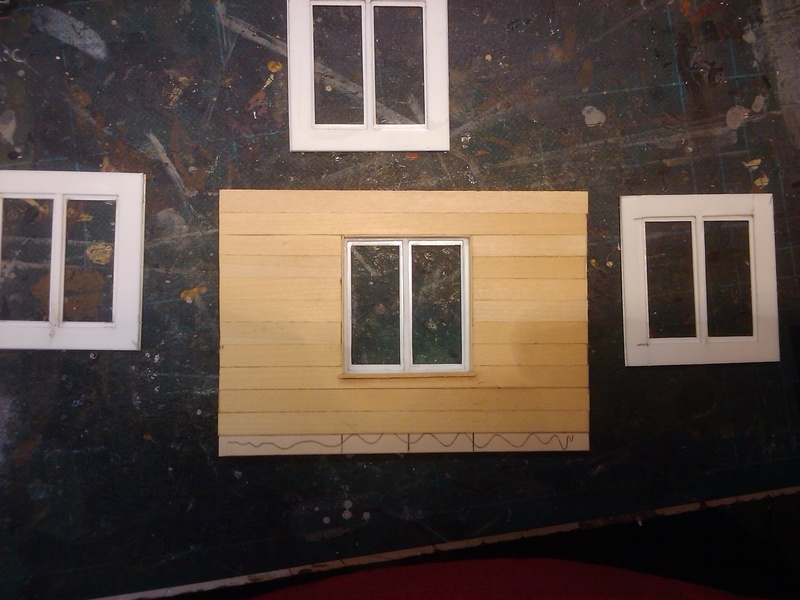 The window frames are made up of two layers, the first photo shows them being cut from plasticard; the second shows the assembled unit with one fitted temporarily in an end wall. They'll be glazed using glass microscope coverslips. 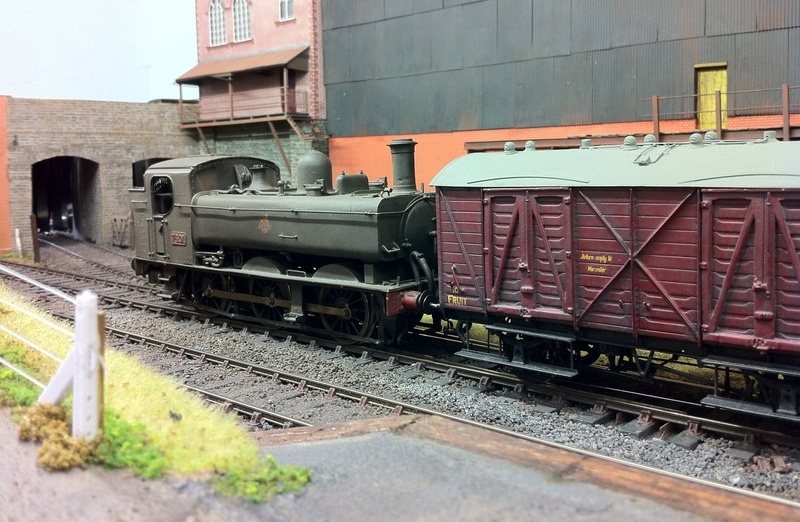 Wagonman is building a variety of lesser-yellow-spotted brake van. This shorter-than-average brake van will work on Pavilion End where, because its a minimum space layout, you can only just get a 6 wagon coal train in the fiddle yard. This shorty will make it a little easier. 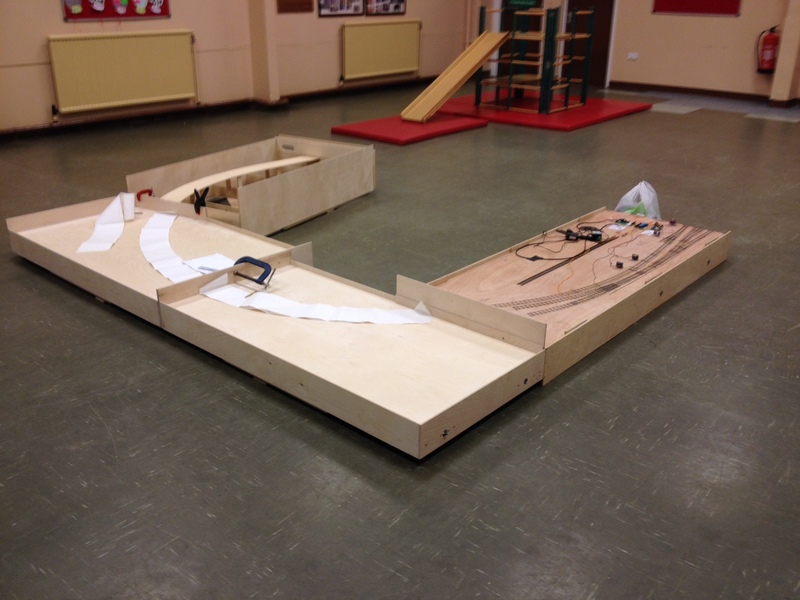 Some of the foam underlay has been put down on the LMJ boards and completed turnouts put in place. These are at the Pontypool end of the layout where the brickworks siding diverges sharply. Whilst members of the club are dedicated to club projects and making things for any of our layouts, there are some who have other, sometimes weird, interests. So Miles the Dentist owns up to this one, recently through the paint shops for primer along with this Cl120/Swindon Cross-Country DMU seen below. This is from DCKits and needs a little filling and filing but has gone together well. Seating is being applied to the floor. Frecclesham Station building continues, now moving on to windows. Returning from holiday, XYS finally found his laptop which had been hidden from home. 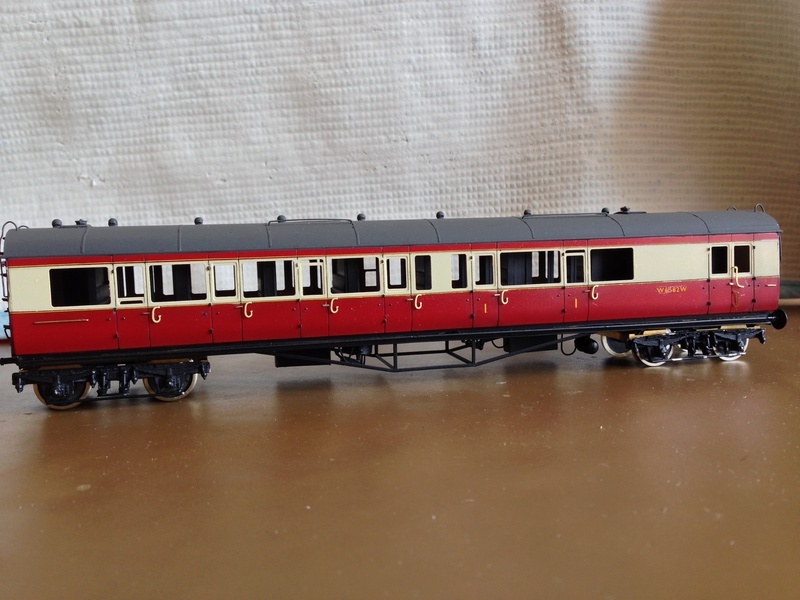 But he used his time away well and put together the chassis for this 2251 Collett Goods. The inside valve gear does work, flapping around a bit but it still needs a final fitting. However, things did not go smoothly with the body as the kit contained etches dated 2004 but the instructions referred to etches dated 2006 which were different. Some spare parts have arrived, however. And a close up of the valve gear. Back to weirdness, XYS has volunteered to build a few turnouts for LMJ. This means he has to get to grips with the Mike Clark etched chair system and has made a start here. The lovely weather means that the clubroom gets rather warm and a mug of tea is just too much so we switched to Dandelion and Burdock as featured below. So someone noted it could be mistaken for Southern Comfort/Cold Tea/the standard NMRS toasting tipple. So now we have Fizzy Tea as well as cold tea. Welcome back to Steve Bell, refreshed from deepest France, regailing us with stories and pictures of steam train trips in the south near Lyon. But he did the decent thing and brought back some biscuits. As we were low on numbers there are some left for those able to hurry and arrive early enough this Tuesday. Further progress with the C10 pointwork - the checkrails are now in place. A bit of careful levelling was also done around the nose. And a surprise entry from my home workbench. This is a 7mm David Andrews kit for a 42xx in progress, destined for the coal train on Pavilion End. 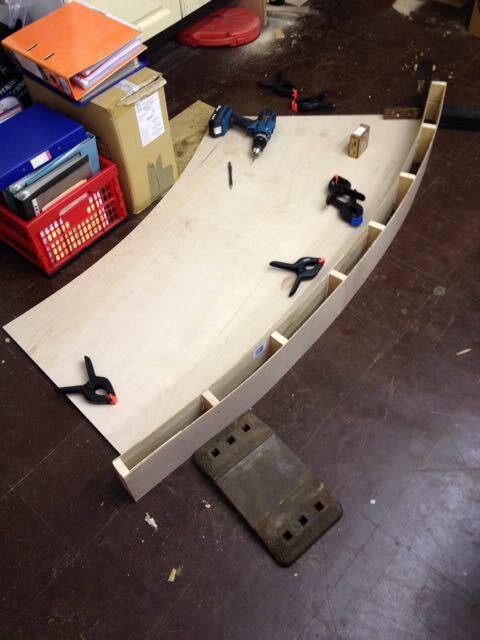 Thanks to TXYS there is already a running chassis, so this body needs completing by the Carmarthen Show in October. No pressure then. Rob continues to work on the Frecclesham station building. With a full set of solebars the GW brake van moves on, needing some filling before painting. Continuing in 4mm mode, the C10 turnout I'm working on has progressed to filing the point blades. Here's the straight one in place. With a better focus on the crossing. And back to work in 7mm. I'm sure we haven't seen this set before. From Wagonman's cupboard or maybe attic comes this Pull-Push set. This was based on some of the Birdcage stock and converted to pull-push operation. They are intended to provide alternative stock on Frecclesham, and Al just likes building coaches anyway. Rob continues with the Frecclesham station building. If it doesn't look as if much has been done, that's because the photos were taken early before enough tea had been drunk. Before my early departure I got the scroll saw set up for cutting foam as underlay for the LMJ track, and did some lengths which I'm happy to say were nice and consistent for thickness. Wagonman is off on brake vans again. Those straps for holding the footboards are always a fiddle and a bit vulnerable. This weekend was all about taking Pavilion End to the Bristol Show at Thornbury. Here's a quick taster but there are more pics on the bristol2014 page. We always aim for good presentation. This gives you an idea of the simple track plan. The mirror at the far end caused comment, and confusion to some. Short trains are the order of the day.